The acoustics are really cool inside these historic stone structures. Spending some time at this place humming, drumming & singing. Stand right in the center floor space for the best sound. 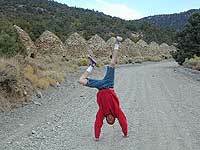 The western ranges of Death Valley National Park offer some interesting sites & hikes. This canyon called Wildrose is higher in elevation, a lot cooler than the valley floor, plus it does get pretty dang windy. 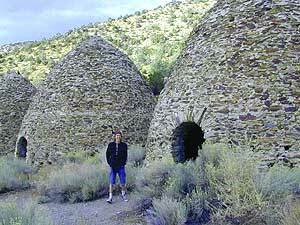 These bee-hive shaped kilns were used in the 1800’s for making charcoal, that was used in nearby mining operations. Standing 30′ high & 30′ around, these kilns were only used for a very short time (in the mining heyday) & are some of the best preserved charcoal kilns in the country. 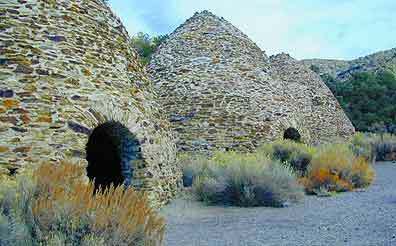 The Wildrose Charcoal kilns are located on the western side of Death Valley National Park. 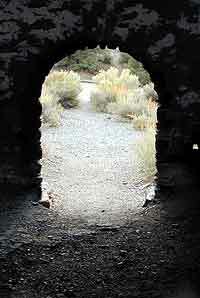 Access the Wildrose Canyon Road from Panamint Valley or from Death Valley Highway 190, take the Emigrant Canyon to Wildrose Canyon Rd up to the historic kilns. Last 3 mi of this road is unpaved and not recommended for RVs or trailers. 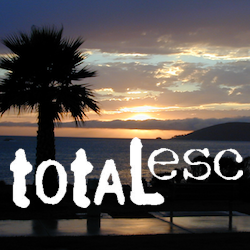 Nearby Panamint Valley is for serious off-roaders: Stone Canyon, Barker Ranch, Goler Wash.
Death Valley Campgrounds – Wildrose, Thorndike, Mahogany Flat. A popular day hike nearby is Telescope Peak, from Mahogany Flat campground, a 14 miles RT hike that leads to the mountain towering over Death Valley at over 11,000′. FACTOID: Telescope Peak is the only place that you can see both the lowest point & the highest point in the continental USA.